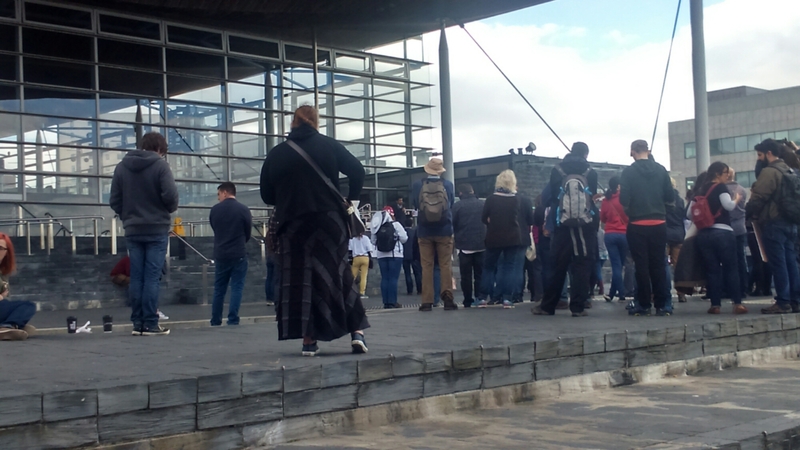 Here’s a couple of snaps of today’s Cardiff March for Science. It was a friendly and fun occasion attended by (at a guess) a few hundred people. 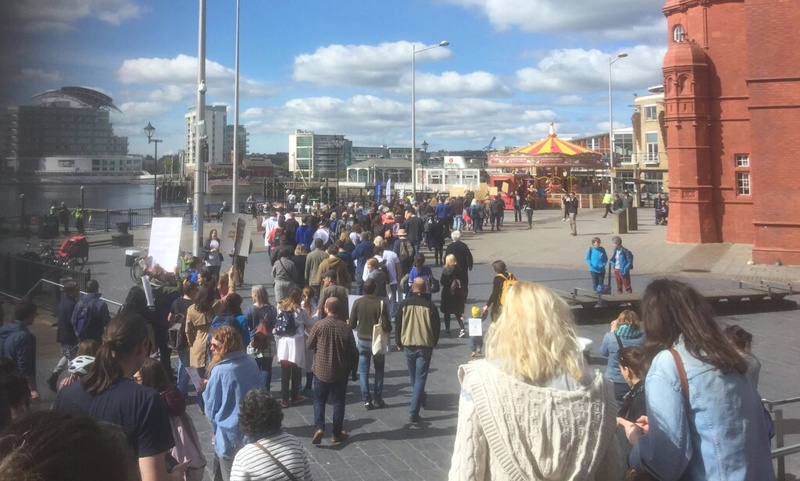 The assembled throng then walked around Cardiff Bay to Techniquest. It wasn’t a very demonstrative march -there was no chanting or anything like that – but then it wasn’t really intended to be a demonstration, more of a very polite celebration! Oh, and nice weather for it! This entry was posted on April 22, 2017 at 3:28 pm and is filed under Cardiff. You can follow any responses to this entry through the RSS 2.0 feed. You can leave a response, or trackback from your own site. Notice the MCC Big Top in the background! The march in London was large – many thousands – and went from the Science Museum to Parliament Square via Knightsbridge, Hyde Park Corner, Piccadilly and Pall Mall. However, it was quiet. There was a little chanting at times (of “What do we want? Respect for science. When do we want it? Now”). Some people near me played plastic harmonicas at times and a woman hit a saucepan with a wooden spoon occasionally. Somebody played a pink trombone. But apart from that it was so quiet and polite we must have appeared a little indifferent. I did feel we needed to make more noise. We needed to have chants and songs on the route. The speeches in Parliament Square raised the passion somewhat. This may be a lesson for future marches. Need to get some cheerleaders in next time. We were talking on the Cardiff March that we easily had enough musicians there to have made a marching band, which would have been fun. Even a few drums can make a real difference. I’m not sure Mahler’s 6th Symphony would help. But, yes, music would be useful on marches. It’s something to consider seriously if there are marches like this in the future. It might be helpful to write lyrics to protest songs to sing to well-known tunes. I wished on Saturday that I’d had a drum.